Glass in the Studio range was made in 15 basic shapes but each piece had a unique combination of colour and effect: some opaque, others boldly striped, the next one subtly shaded.1 The first Studio range was introduced in 1969 by Geoffrey Baxter's then assistant, an Art school graduate called Peter Wheeler and included three finishes of Peacock, Orange and Old Gold. 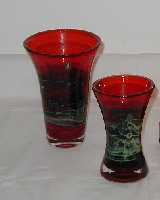 These pieces were high cost and low volume. "A range of studio pieces bringing together the brilliance of traditional Whitefriars ruby with a highly original Kingfisher overlay." 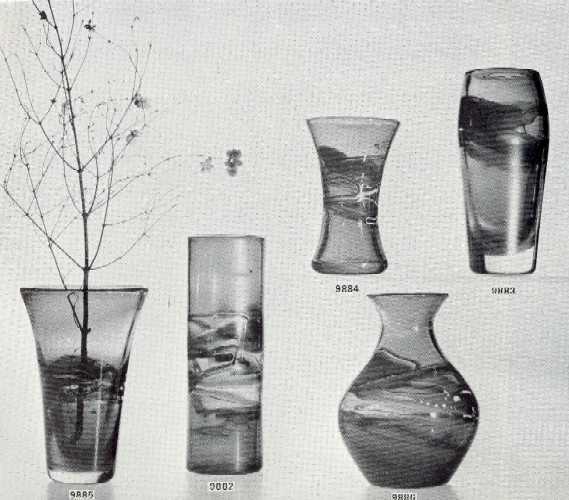 9882 10" high vase, 9883 7½" high vase, 9884 6" high vase, 9885 7¼" high vase and 9886 7" high vase. 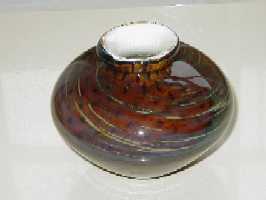 "A range of studio pieces combining a bright golden amber with uniquely individual surface decoration." REF. Text reproduced from the Hardback Whitefriars book by Wendy Evans, Catherine Ross and Alex Werner. 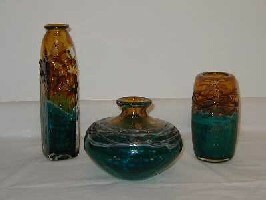 Studio range vases in Peacock finish. Patterns S13 (11½" high), S8 (5") and S5 (7"). The bottom two thirds is a streaky blue-green derived from kingfisher, and the top one third is twilight. At the junction, random strapping in molten twilight with silver chloride was used. Studio range vases in Old Gold finish. 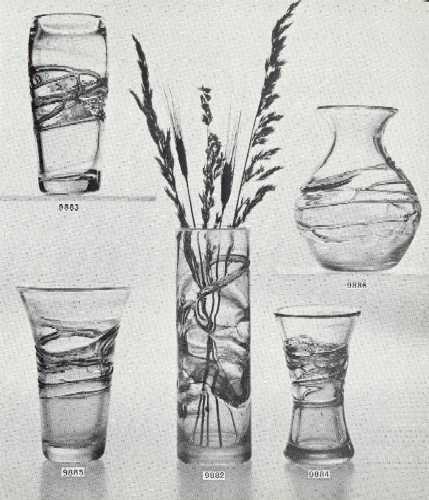 Patterns S11 (5½"), S13 (11½"), S6 (10") and S7 (5"). 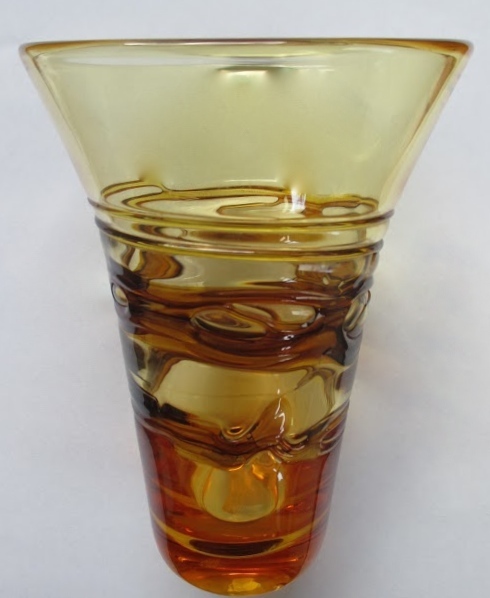 The silvery cream with golden brown stripes were created by lining the inside with opaque white glass, and casing the outside in twilight, which appears to 'suspend' the colour in between. 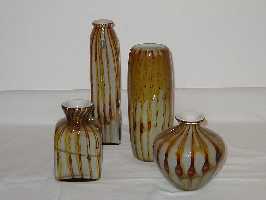 Studio range vases in Orange finish. Patterns S1 (5¾" dia. ), S6 (10"), S5 (7"), S7 (5"). 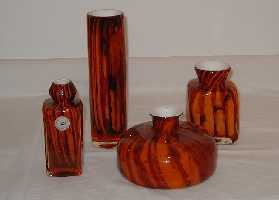 Studio range vases in Orange finish. 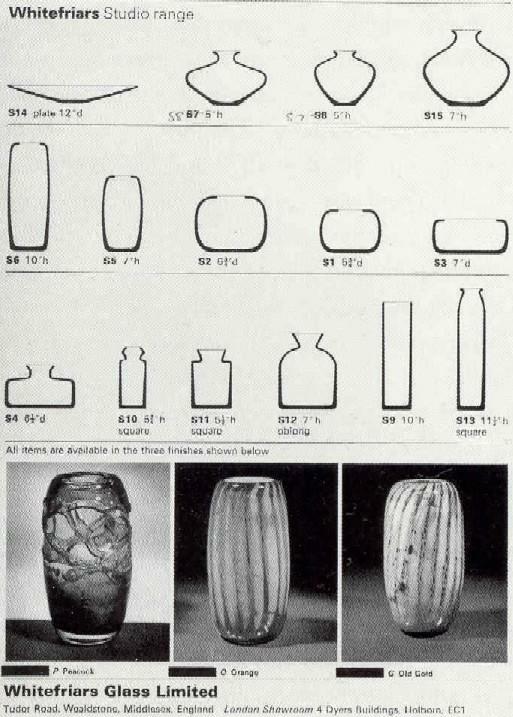 Patterns S10 (5¾"), S9 (10"), S4 (6½" dia.) and S11 (5½"). 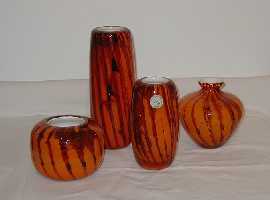 These bright orange brown striped vases were produced in a similar manner to the Old Gold vases, with the colour suspended between twilight casing and an interior of opaque white glass. The stripes were created using silver chloride. A number of one-off experiments were made along the lines of this range in addition to the production pieces which were made between 1978 and 1980. 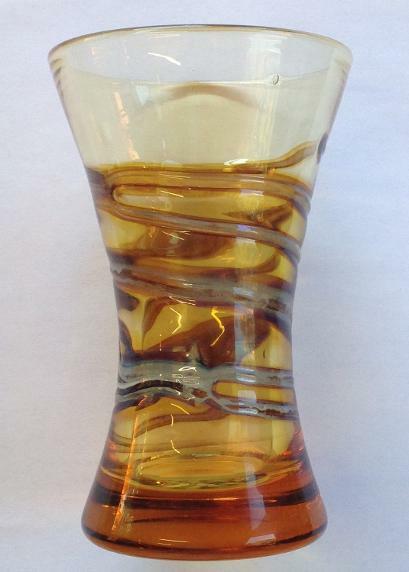 New Studio range piece in golden amber. Pattern 9884. New Studio range piece in golden amber. Pattern 9885.